Shopping for bakers isn’t easy! We’re a fussy bunch and very particular about our tools. I’ve actually received a number of emails from parents and partners, desperate to figure out what to buy for their beloved baker. Here’s a list of my personal favorites, sure to please the cake or baker in your life. 1. CakeSpy customized print of a cupcake riding on a unicorn among hearts, clouds, and a rainbow shooting star. If this doesn’t bring magic into your life, nothing will. Available in the CakeSpy shop on Etsy, a steal at $15.00. 2. My very own letter molds! I designed these molds myself, so I’m obviously partial to them. 😉 They’re made of a high quality food-grade silicone and can be used with fondant, gum paste, poured sugar, pressed sugar, chocolate, and even cookie dough! Yes, these are oven safe. TONS of lettering possibilities. Pick them up in my Etsy shop, $42.00. 3. I am so fussy about aprons. Tied straps around my neck drive me absolutely crazy! And finding an apron that’s comfortable around the, um, girls, can be challenging. That’s why I adore the No Tie Aprons from the Vermont Apron Company. They’re available in a wide range of sizes and come in the most beautiful assortment of vintage-inspired fabrics. The one pictured is $39 and available here, Vermont Apron Company. 4. My cake-buddy, Erica O’Brien, has a killer eye for design and knack for finding the coolest cake stands. She has a variety for sale on her website, Erica O’Brien Cake Design, but this one takes the cake. It’s an investment piece at $275, but if you make wedding cakes, it’ll pay off in spades. 5. At a little over 4-inches in diameter, this itty-bitty turntable is the perfect stocking stuffer for anyone who decorates cookies or likes to sculpt small figures out of gum paste or modeling chocolate. For $3.25, it’s a total steal. Pick one up here, Small Clear Plastic Lazy Susan Turntable. 6. Bakers are always looking for unique little touches that will set their cakes and goodies apart from the others. Sweetopolita‘s new line of sprinkle blends are gorgeous and unlike any others on the market. My personal fav, the Happy Unicorn Sprinkle Medley (duh), is available in the Sweetopolita Etsy Shop, $11 for 8oz. 7. I’m not exaggerating when I say this scraper changed my life. You’ll breeze through your buttercream crumb coats and ganache finishes with this sturdy, stainless steel blade. 12-inches of cake smoothing goodness for only $21, handmade by Fat Girl Cakes. 8. These narrow measuring spoons are another baking tool that I swear by. They easily fit into spice bottles with small openings and the flat ends help scoop up the last little bits at the bottom of the container. I’ve had the same set for over 10 years. Pick them up at Williams-Sonoma for $16. 9. & 10. The New York Times Store has a multitude of personalized gifts for the home and kitchen, including cutting boards and (coming soon) a breadbox. 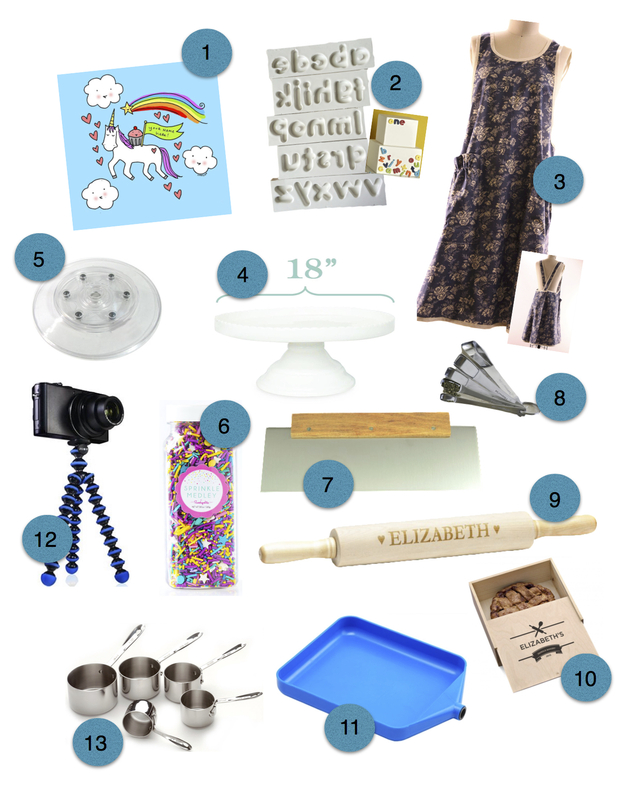 My personal favs are the personalized rolling pin ($44.95) and pie box ($49.95). They’re functional, pretty, and something your favorite baker is likely not going to pick up for themselves. 11. Tidy Trays!!! I only recently learned of these magical little tools and have already decided that I cannot live without them. No more wasted sprinkles, dragees, and confetti quins. Pick up a 2-pack (small and large) for only $9.99 here: Tidy Trays. 12. Us cakers are all online, all the time now. Many of us use our phones to take quick pics, shoot short tutorials, or live stream on Facebook or Periscope. I use the JOBY Gorillapod Flexible Tripod when I need to keep my phone steady and hands free. This one specifically has the attachment for holding a smartphone, but you can take it off if you want to use the tripod with a traditional camera. $19.99 available here: JOBY Gorillapod Flexible Tripod. 13. I’m a beast on measuring cups. I’ve torn the handles off of more sets than I’d like to admit. Finally, I met my match with these All-Clad Stainless Steel Measuring Cups. Yes, at $49.95, they are more than you’d probably imagine spending on measuring cups. For someone like me, they’re actually a bargain when you add up the many sets I’ve crushed through the years. These are in it for the long haul. Added bonus – they’re just like tiny little All-Clad pots, so you can use them right on the stove to melt butter, warm cream, etc. Tell Santa you need these and that he can pick them up here: All-Clad Stainless Steel Measuring Cups. When all else fails, give the gift of learning! (Or treat yo’ self!) 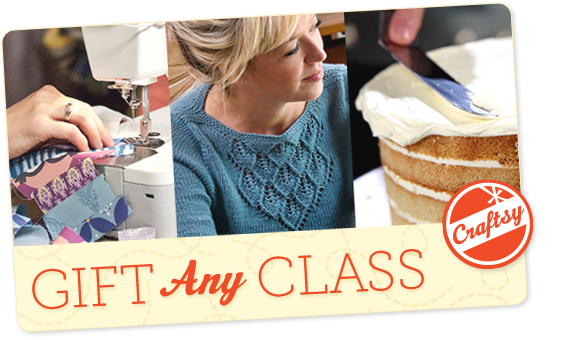 With frequent sales and the best darn instructors around, Craftsy classes make for a fantastic gift. Give a gift card here: Craftsy Gift Cards.